Junior lineman Corey Little works on blocking in practice. The team will play its spring game against Pine Crest at 7 p.m. on May 23. With a new coaching staff comes a new mindset for the football team. 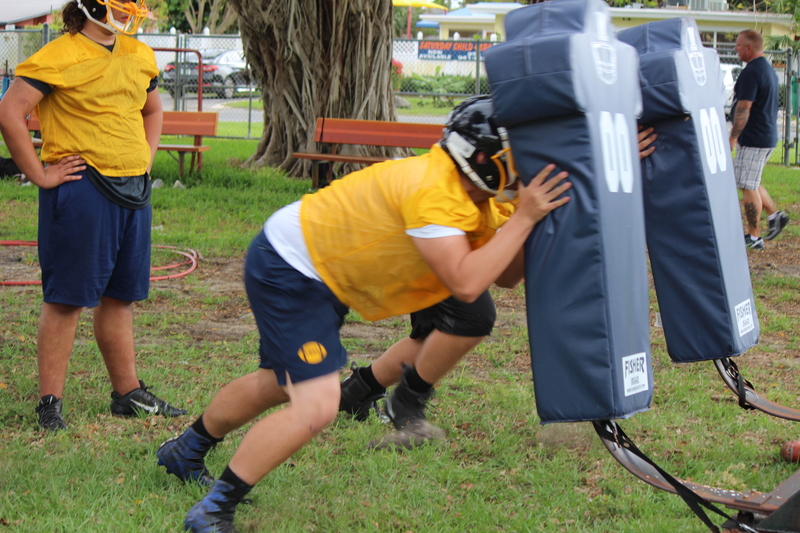 Its goals include winning the annual spring game, which will be held at 7 p.m. on May 23 at Pine Crest. The spring game has always played an essential part in preparing the team for the upcoming fall season, which starts with the kickoff classic game. The players believe that the outcomes for their seasons will be better this year due to the help of their new coaching staff. Little and the other captains help to choose the drills and training needed. “As the offensive-line and defensive-line captain, I lead through drills helping the younger linemen with their technique and form along the way,” Little said. Drills in practice include W-drills, agility drills and team scrimmages, all executed by the coaching staff and captains. Players believe that the training and continuous support from the new coaches will push them to do well, especially at the game. Goals are persistently being made by this new team, and they not only want to win more but also work on their teamwork skills and brotherhood as a whole.